The 2017 Build Up our Food Bank is fast approaching! 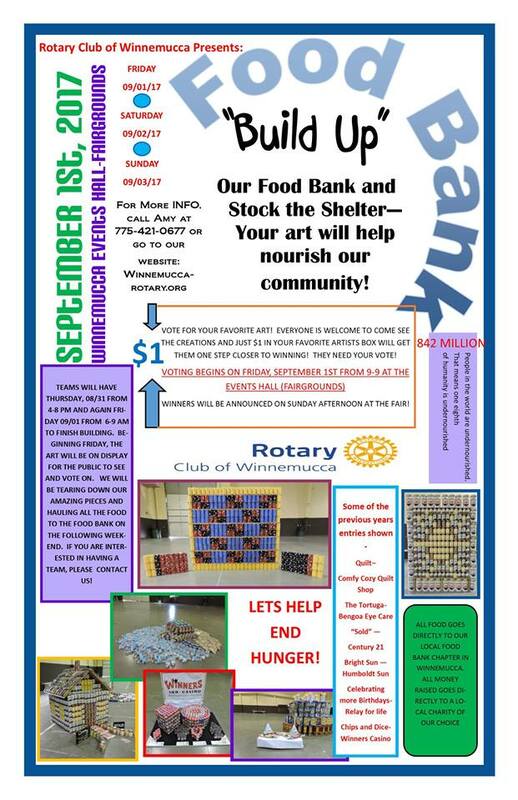 Gather your teams and help our community by creating fun works of art....made entirely from canned goods! This year we have partnered with the Tri-County Fair to host our artwork throughout the Labor Day weekend at the Winnemucca Events Complex. Your businesses and organizations will receive much deserved recognition for your building accomplishments as guests to the complex admire and vote on your artwork. Teams will have Thursday and early Friday morning (August 31st and September 1st) to build their art pieces. Beginning at 9 am on Friday, the displays will be open to the public. One lucky participant will win the coveted "People's Choice" award for the most votes. Just $1 per vote helps your favorite artistic group or business get that awesome prize and bragging rights! For any further questions, concerns or ideas, please contact Amy Edwards at 775-421-0677 or by email at amyedwards89445@gmail.com. A simple, one-page team registration will be required to participate.